A couple of weeks ago, I shot my 1st project for 2019. It was quite a big production involving 5 models and 2 make-up artists, in a studio that wasn’t my own. So it was quite a challenge to get it all arranged. But I think I pulled it off nicely. At least judging from the reactions, we have produced a couple of nice pics. After presenting these 5 lovely ladies in lingerie in an earlier post, today I have a more casual look to share with you. I am not used to running big productions like these. I could not have done it without the generous help of my friends Michel & Karen. Thank you guys! Fortunately, I did not have to worry about make-up on this production. The very talented make-up artist Elem and her friend Manouche had that covered. And they handled it beautifully! And a very big thank you to all 5 models off course: Elise, Liesbet, Sharon, Cindy and Caroline. I recently bought a Falcon Eyes FLC-65 ring light. A make-up artist I worked with last year, uses it to light up the model’s face while she applies make-up. I was quite impressed with the output of the light. As the light was not too expensive, I decided to have a go at it. My beautiful friend Romi was kind enough to sit down with me for a 1st test of the light. She’s used to model for me. She knows to be a little patient with me when I want to test new gear or new setups. She’s also confident that something good will come out of those little test sessions. It took me a little getting used to shooting with continuous light, an ISO over 100 and have my lens wide open. But once I got the hang of it, we produced a few nice portraits. I have been working with plus-size models from long before it became fashionable to grace their curvy beauty on the cover of magazines like Sports Illustrated or on the catwalks of NY Fashion Week. Long before the hashtag #PlusIsEqual was ever invented. I honestly believe women are beautiful, no matter their size. Riding the coattails of the hype, I started working on my own #PlusIsEqual production. It seemed the appropriate time to gather a few of my favorite curvy models and show you all how beautiful they are. Last weekend, I had the pleasure of having these 5 beauties in a studio. A big thank you to the models. Caroline, Sharon, Liesbet, Elise and Cindy: you are amazingly beautiful ladies and it was an honor and a pleasure to work with you! But this pic wouldn’t be anything without excellent work of Elem and Manouche–the 2 make-up artists of the day– and the help of my friends Michel & Karen who were kind enough to let me use their studio for the shoot. Thank you! Thank you! Thank you! After a 10 year hiatus, I got reconnected with my very 1st model I ever worked with in early 2018. We promised not to wait another 10 year for the next shoot. And we kept that promise: I got to work with Daria for a 2nd time in 2018 and here’s a couple of results from that shoot. 50 years ago today, the crew of Apollo 8 reached lunar orbit for the 1st time ever. Astronauts Frank Borman, William A. Anders and James A. Lovell Jr. became the 1st humans to fully escape earth’s gravity and enter the gravitation field of another celestial body. They also became the 1st humans to see the dark side of the moon with their own eyes. Their mission was an overwhelming success: they proved that mankind was ready to set foot on the moon. 7 months later, Neil A. Armstrong–commander of Apollo 11–would indeed become the 1st human to set foot on the moon. 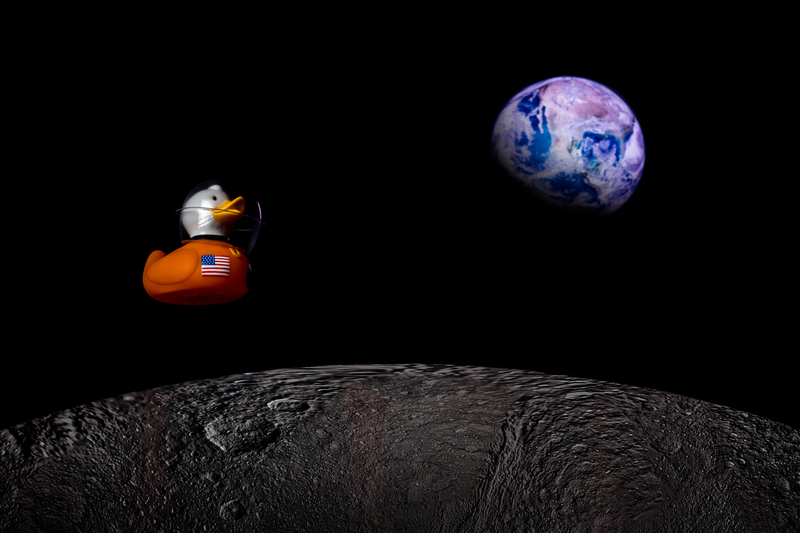 In honor of the crew and the hundreds of engineers and technicians that worked to make Apollo 8 a success, I made this photo of #duckie a couple of years ago. I shot it in my photo studio at home, with very little help from Photoshop. And if there was ever a better way to wish everyone a Merry Christmas and a Happy New Year, it would be in the words of the crew of Apollo 8 as they circle the moon on Christmas Eve 1968. I can not find a better way to wish all my friends happy holidays and all the best for 2019.